Conservationist group Sea Shepherd say that they have "shut down" Japan's annual whale hunt in the Southern Ocean -- announcing that no whales have been killed for the past seven days as the whaling fleet has been thrown into disarray. 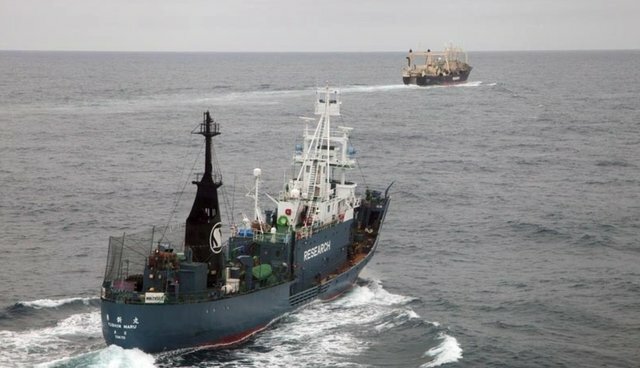 Sea Shepherd's Peter Hammarstedt, captain of The Bob Barker, says that the aim of their activities, targeting the whaling fleet's mothership Nisshin Maru, has been successful in curbing the slaughter. "The primary strategy of our Antarctic Whale Defense Campaigns is to secure the slipway of the Nisshin Maru, and allow no dead whales to pass into this floating abattoir: We have achieved this goal. We will continue to block the slipway of this poaching ship, relentless in our mission to protect the whales and the sanctity of the Southern Ocean Whale Sanctuary." All told, Sea Shepherd's three anti-whaling ships have prevented whalers from capturing whales for 14 days in January, typically the most deadly month of the hunt. The group estimates that around 350 whales were saved due to the disruption. "2014 has been a great year for the whales so far," says Adam Meyerson, captain of The Sam Simon. "Now that Sea Shepherd has a small navy, it gives us flexibility to use our ships to keep the whaling fleet on the run and out of the hunt indefinitely."